I think everyone goes through a “drawing creepy things in college” phase. 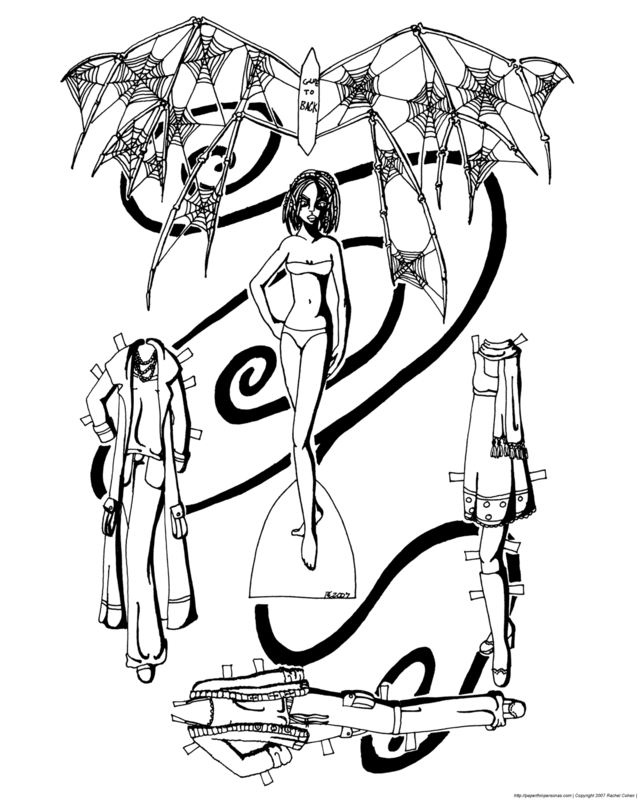 This paper doll was part of my “drawing creepy things in college” phase. I was obsessed at the time with the Duino Elegies by Rilke. The First Elegy contains what remains my favorite Rilke quote, “Because beauty’s nothing but the start of terror we can hardly bear, and we adore it because of the serene scorn it could kill us with. Every angel’s terrifying.” I memorized the entire first elegy out of the A. Poulin Jr. translation I bought for a dollar at a thrift store in college. Anyway, this paper doll was inspired by angels (the terrifying kind) and fairies (also the terrifying kind) and so she’s a little dark. She’s up in the Printable Paper Doll Index along with the rest of the random non-series paper dolls I’ve ever posted. Since it’s the last day in May, this also begins my month long hiatus. I will still be checking in on the blog, and checking my email, but I have conferences and work obligations that are going to make this coming month nearly impossible for my usual update schedule. I think fairies should be a little strange and a little other worldly and even a little scary. The Victorian conception of the sweet flower fairy stands in stark contrast to the traditional stories filled with figures like Banshees and the Washer Women and Jenny Greenteeth, or even Baba Yaga. So, today I went to a Greek food festival with some people and ate much tasty Greek food. It was fun and edible. There was music and children dancing dances which reminded me of nothing so much as Jewish Camp, which I went to in the summers and where we’d learn to dance traditional folk dances. I had a good time and it was nice to get out of my apartment for a while and be social with people. I don’t do that often enough. 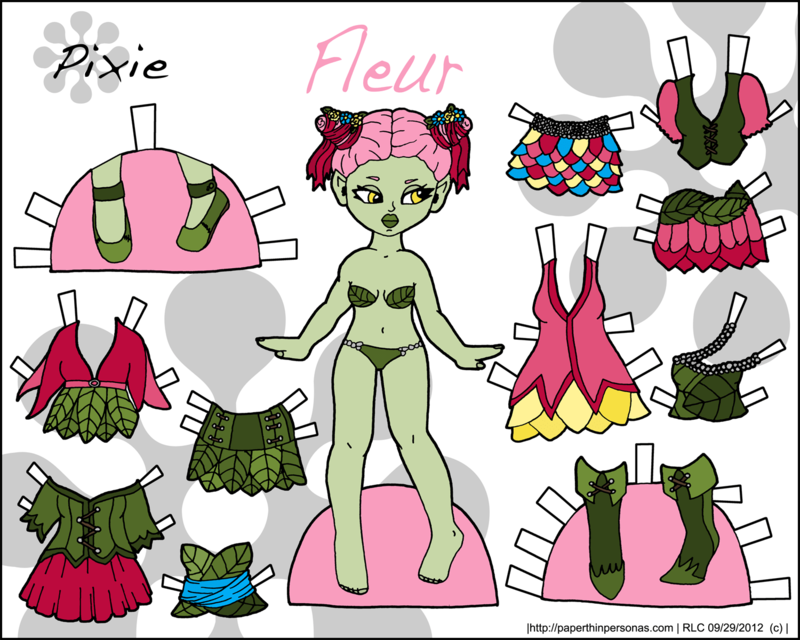 By the way, if you decide Fleur needs friends, she can hang out Belladonna and Flora , my other two fairy Pixie paper dolls. My favorite fairy paper doll of them all is Flora Fauna of the retired Curves series, I think she’s more creepy than cute. So, I have good news, bad news and slightly indifferent news. The good news is- Hey, look it’s a paper doll post. The bad news is that it will probably be the only one for the whole week. The indifferent news is that the paper doll is in black and white. I chose to post Spirit of the North in black and white since the dolls dresses have a lot of pattern to them and I thought it would be more interesting to color than some of my other paper dolls. Happy Halloween! And to celebrate this festive day, I have a halloween paper doll. I always have these high expectations and plans for Halloween. I mean, is there a better holiday for paper dolls? It’s all about costumes, for gods sake. It’s perfect. And yet, somehow, I never manage to actually get my act together enough to do anything major for the holiday. Sad, but true. Last year, I actually drew this paper doll set. The idea was to do a whole month of costumes. Obviously, that didn’t happen last year and it didn’t happen this year, but since I’d never finished coloring this set, I thought I would post it now. The strapless white dress can either be used as the base for the Egyptian Queen costume set or the Angel costume set. The wings should be glued to the back of the doll along the white strip. I hope everyone has a safe and fun Halloween. I’m planning on spending mine doing laundry, cleaning the apartment and handing out candy to small children. Technically, today is graduation, but since I’m not walking, I didn’t seem much point in going to it. I also didn’t see much point in emerging from my apartment onto the total chaos that is the University around graduation time. This weekend has been busy with birthdays and helping my friend out by picking up her graduation robe and making sure it got to her. She is walking, she says so that her grandmother can brag appropriately to the other grandmothers at Church on Sunday. I plan to send my Grandma a note saying I had my degree with a picture of me in front of the building. That will have to do for her bragging needs. Since I’m continuing onto a Masters in Theatre History there doesn’t seem to be much point in getting to worked out about my gradutation though it is kinda nice to say that I’m a librarian now, all offical like. Last year, one of my most common search terms was “Gothic Fairies” and I felt rather bad about this since I didn’t have any on the site. So, at least now there is a slightly gothic fairy paper doll available for anyone whose looking for a gothic fairy paper doll. Actually, I wasn’t totally sure what a Gothic fairy paper doll was, but my research (google image search) suggests layers of torn garments and pale skin seem to be requirements of the gothic fairy look. I rather think she needs wings, but I don’t know how to add them, so that might be a later addition to the set. The paper doll is rather a companion to Flora (not to be confused with my wooden doll named Flora. Apparently, I like the name Flora…), who is my other fairy paper doll. I don’t usually draw fairies, but they were fun.